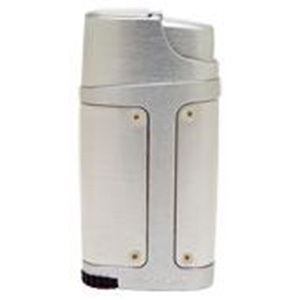 Xikar Element Lighter Silver, The Element bold technical style will catch everyone eye while its powerful double jet flame fires up a Churchill in seconds flat! It boasts a simple thumb action that opens a protective cap to expose a Piezo ignition. A fuel gauge and oversize adjustment wheel ensure the right amount of flame anytime. The body is a metal casing with durable polished finish.